e-ONE Tours & Travel offers a wide range of tours around Lombok. We provide tour options for individuals to large groups and you can choose from set tour itineraries of half-day trips, to full or multiple day excursions. Alternatively, you can create a personalised tour, tailored to suit your own interests and needs, to take in the best the island has to offer. Our departure points are flexible - your hotel or directly from the airport! Our experienced drivers and guides are all from Lombok, speak English, and have extensive knowledge of their island, culture and history. If required, German speaking guides can be organised by arrangement. 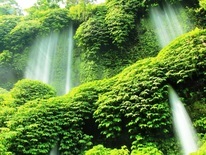 Visit magnificent waterfalls in lush jungle on the cool slopes of Mount Rinjani. A walking tour to Benang Stokel and Benang Kelambu waterfalls in Central Lombok. Visit the exquisitely beautiful beaches fringing the north-west coastline of Lombok. A spectactular trip to three beautiful coral islands – Gili Trawangan, Gili Meno and Gili Air. Marvel at the beauty of the south-east peninsula, with a visit to ‘Pink Beach’. A trip to a private coral island for sea and underwater lovers. This is a fabulous trip to Gili Layar and Gili Ringgit, just off the south-west peninsula of Lombok. A walk off the beaten track through mountain villages, terraced rice paddies and cool air. Find out how Lombok’s famous cultured pearls are produced. This tour highlights the best of Sasak culture, villages and local handicrafts. Visit historical sights of the former Balinese Kingdom on Lombok - in and around Mataram, Lombok’s capital city. This is a great option for those who enjoy bustling cities, shopping and browsing for souvenirs. Enjoy a round of ‘Panoramic golf’ in the north of Lombok island. Lombok is one of the best diving sites in Indonesia, offering diving for all experience levels. A glorious catch - Angling magic.